Four athletes from Hanover Central High School attended a leadership conference held by the Greater South Shore Conference. The conference was held at Lake Station High School on Wednesday, Feb. 6th. Luke Barach, Madison Fanta, Carina Bolanos, and Cole Cameron listened to two speakers, Sandra Walter, Assistant Commissioner for the IHSAA and Steve Farley, Head Baseball Coach at Butler University. Sandra Walter spoke on sportsmanship and explained the role of the IHSAA in sportsmanship and the initiatives that they are putting in place to ensure that all athletes have a wonderful experience as they compete around the state. She explained the point system that all schools adhere to and how you receive and lose points during the year. She also explained the consequences of falling below an acceptable level. 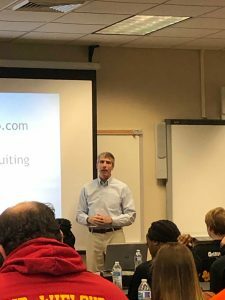 Steve Farley then talked to all the student-athletes about the recruiting process and took them all through the steps needed to get them an athletic scholarship. He talked about the do’s and don’ts of trying to get your name out to a particular school and even how to pick the school for you. A copy of his college recruiting handout will be made available in the Athletic Office very soon. If you have any questions, please feel free to stop by and check it out!